To Cite: Khorsand Zak H, Mafinezhad S, Haghbin A. Congenital Tuberculosis: A Newborn Case Report With Rare Manifestation, Iran Red Crescent Med J. 2016 ; 18(10):e23572. doi: 10.5812/ircmj.23572. Introduction: Congenital tuberculosis is an infrequently encountered condition and only 300 cases were reported in the literature till 1989. There are no specific signs and symptoms pathognomonic for congenital TB, and the devastating consequences in the absence of early therapy signify the importance of early diagnosis and treatment during the neonatal period. Case Presentation: In this paper we report on a case of congenital TB in a newborn who was admitted to our clinic with seizures and intraventricular hemorrhage (IVH) due to TB meningitis. Her mother was diagnosed with active pulmonary TB and treated with a multi-drug anti-tuberculosis regimen. Her screening for human immunodeficiency virus (HIV) was negative. 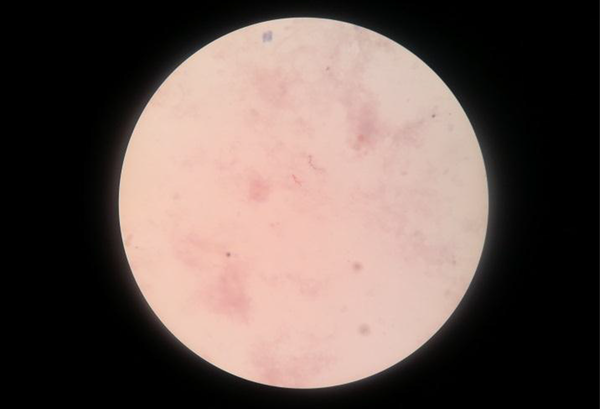 Cerebrospinal fluid was collected and showed protein levels at 300 mg/dL, glucose at 27 mg/dL (serum glucose level was 76 mg/dL), many RBC, and a positive result for acid-fast bacilli on smear microscopy, all of which were compatible with tuberculous meningitis. Conclusions: It is important to consider TB meningitis in newborns with perinatal IVH and concomitant hydrocephalus particularly when the mother has a history of TB prior to or during pregnancy. Tuberculosis (TB) is one of the leading infectious diseases in the world and is still a serious public health problem in Iran. The WHO estimates that nearly 30 percent of Iran’s population is infected with TB (1, 2). Congenital TB is an infrequently encountered condition, but in many countries there is a global increase parallel to the human immunodeficiency virus (HIV) pandemic. Only 300 cases were reported in the literature prior to 1989 (3). Congenital TB may occur as a result of maternal TB when it involves the genital tract or placenta. Mothers of these infants frequently have tuberculous pleural effusions, meningitis, and disseminated disease, but a few of them were diagnosed at the time of delivery or afterwards (4-6). There are no specific signs and symptoms pathognomonic for congenital TB, and the devastating consequences in the absence of early therapy signify the importance of early diagnosis and treatment during the neonatal period (1, 7). Clinical manifestations are non-specific and include poor feeding (100%), fever (100%), irritability (100%), failure to thrive (100%), cough (88.9%), and respiratory distress (66.7%). Examination reveals hepatosplenomegaly (100%), splenomegaly (77.8%), and abdominal distension (77.8%) (8). Diagnosis of TB meningitis (TBM) is even more difficult. This is because it does not occur suddenly with classic meningitis symptoms. Two hundred and fifty-nine cases of TB meningitis were reported in England and Wales in 2006, and TBM has been reported to occur in infants as young as four months old (9). If tuberculosis is to be diagnosed in infancy, systemic evaluation and family screening for tuberculosis, especially for mothers, must be performed (1). Ray et al. recommended that treatment regimens for congenital TB should contain at least two, or preferably three, drugs that the organisms are likely to be susceptible (10). In this paper we report on a case of congenital TB in a newborn who was admitted to our clinic with seizures and intraventricular hemorrhage (IVH) due to TBM, with the aim of creating awareness of its atypical signs among newborns in this region. A ten-day-old boy, the first child of non-consanguineous Iranian parents, presented with a fever, seizures, and an increased head circumference. He was delivered normally at term with a birth weight of 2.9 kg and received the BCG vaccine within 24 hours of his birth. Pneumonia and hydrocephaly was detected at his first evaluation one week after birth and nonspecific antibiotic therapies were started. His mother was separated from him due to reactivation of her tuberculosis and treated with four drugs beginning 10 days prior to delivery. He was formula fed after birth. He was admitted to our clinic at Bentolhoda hospital in North Khorasan, Iran in September 2014. On physical examination, the patient weighed 2.6 kg and showed poor activity, lethargic behavior, pallor, a fever of 38.7°C, tachycardia, tachypnea, dehydration, pneumonia and wide skull sutures. Organomegaly was not detected in his abdomen (Table 1) (11). Laboratory analysis showed elevated erythrocyte sedimentation rate (ESR = 35) and a leucocyte count of 8300/cu mm (20% polymorphoneuclear cells, 63% lymphocytes, 12% monocytes and 5% eosinophil), anemia (HgB = 10.5), thrombocytosis (Plt = 706000) and minimal impaired liver function tests. In our newborn ward, the patient’s pulmonary infection was treated with cefotaxime and ampicillin therapy. In spite of this combination therapy, his fever remained and his conscious level status deteriorated; after adding amikacin to his treatment, his general condition began to improve. Chest X-rays showed upper zone pneumonitis on his right side (Figure 1). Abdominal ultrasonography confirmed that there was little fluid collection in Morison’s pouch without any organomegaly. CNS evaluation by ultrasonography and computerized cranial tomography revealed IVH and severe four-ventricle hydrocephalus (Figure 2). Evaluation for TORCH study was negative in both baby and mother. Because of the mother’s history of TB, we suspected that he might have congenital TB. Early morning gastric aspirate was negative for acid-fast bacilli on smear microscopy on three consecutive days. Cerebrospinal fluid was collected and showed protein levels at 300 mg/dL, glucose at 27 mg/dL (serum glucose level was 76 mg/dL), many RBC, and a positive result for acid-fast bacilli on smear microscopy, all of which were compatible with TBM (Figure 3). Tuberculosis screening was performed for all family members who had had close contact with the patient. Her mother was diagnosed with active pulmonary TB and treated with a multi-drug anti-tuberculosis regimen. Her screening for human immunodeficiency virus (HIV) was negative. Ophthalmologic consultation was done and reported normal. He was administered a four-drug anti-tuberculous treatment of INH (10 mg/kg, PO), rifampicin (RMP) (10 mg/kg, PO), pyrazinamide (PZA, 40 mg/kg, PO), streptomycin (STP, 30 mg/kg/ day, IM). Steroid therapy was given at 2 mg/kg for two months and then tapered. Lumbar punctures for reduction of cerebral fluid were performed on five consecutive days after neurosurgical consultation. Within a few days after the therapy was begun, the infant showed remarkable improvement: his fever and increasing head circumference were controlled and he had gained weight. He was discharged with INH, RMP, PZA, and STP, and referred for surgery. A repeat chest X-ray was normal. In a follow-up visit after one month of treatment the patient had gained weight and was well. This report emphasizes the importance of considering congenital TB through the examination of the case of a newborn with seizures, hydrocephalus, and meningitis, who failed to respond to conventional treatment. Also, TB meningitis should be considered in the differential diagnosis of an infant presenting with acute IVH and progressive concomitant hydrocephalus. Transmission of the Koch bacilli can happen during pregnancy through a hematogenous route, but more frequently occurs through ingestion or aspiration of amniotic fluid infected via placental or umbilical vessels from a mother with primary tuberculosis. This form of TB is described as congenital tuberculosis (1). Another author also defined true congenital TB as the acquisition of a tuberculosis infection by newborns shortly after birth; these TB infections tend to progress rapidly to serious complications in a large proportion of untreated infants (9). Cantwell et al. described the median age of presentation of congenital TB as being 24 days (with a range of 1 - 84 days) (12). In our case, TB was diagnosed within the first two weeks of life. Clinical and laboratory findings for demonstrating congenital TB were reported as 1: a newborn with unresponsive worsening pneumonia, particularly if the infant is from a TB-endemic area, 2: the mother has been diagnosed with TB and the baby has non-specific symptoms, 3: CSF reveals a high lymphocyte count in the absence of any identifiable bacterial pathogen and 4: the presence of fever and hepatosplenomegaly (1, 10). Our case had pulmonary infiltration, seizures, and communicating hydrocephalus in cranial computerized tomography. He had respiratory symptoms that failed to respond to conventional treatment and failure to thrive after birth. Early onset and multisystem involvement supported a diagnosis of true congenital TB. An important clue in the diagnosis of infection was the positive history of tuberculosis in the mother. Hepatosplenomegaly and respiratory distress are the most frequent signs of congenital TB, but in our case the predominant clinical findings were lethargy, a fever of 38.7°C, pallor, minimal impaired liver function tests and meningitis, none of which are pathognomonic, and hepatosplenomegaly was not detected, possibly due to early diagnosis (13). Although Hagemann et al. 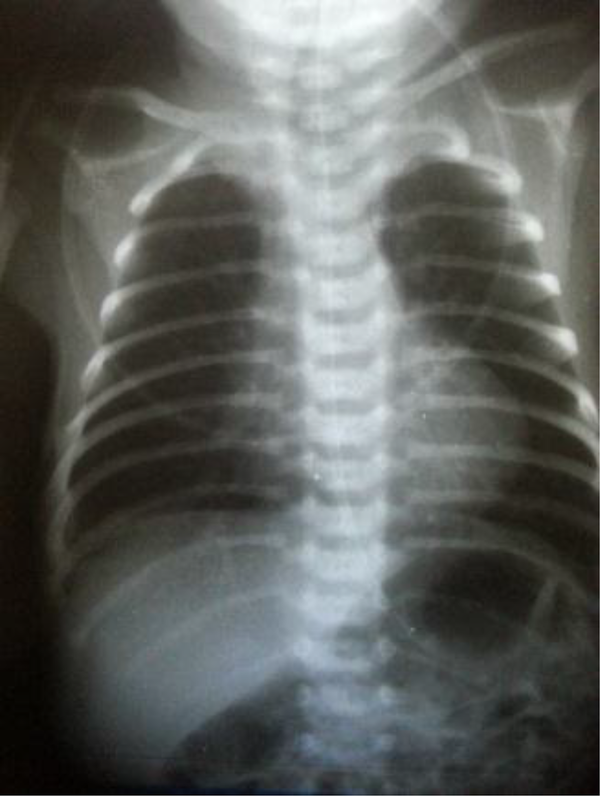 showed that 50% of infants with congenital TB presented with a miliary pattern of pulmonary involvement, in our case the patient showed only upper zone pneumonitis (14). TBM is usually considered a disease of children older than 6 months, but our experience illustrates that infection can take place at a very young age. Laboratory investigations for congenital TB in the neonatal period include analysis of early morning gastric aspirate for acid-fast bacilli, mycobacterium culture of all bodily fluids, and biopsies of specimens such as lymph nodes, liver and placenta. The tuberculin skin test (PPD) is universally negative in neonates at initial presentation, but usually converts to a positive result month later (7). Despite the acid-fast bacilli smear test very rarely being positive in cerebral fluid, our case was positive in two consecutive specimens collected via lumbar puncture. All symptoms and signs, especially progressive hydrocephaly and seizures, were improved with anti-tuberculous therapy in our case. In conclusion, we demonstrated a case of true congenital TB meningitis with clinical investigation in addition to a positive history of tuberculosis in the mother. We have supported this diagnosis with laboratory examinations such as examination of CSF for acid-fast bacilli and multisystem involvement. With anti-tuberculous therapy, clinical remission happened within a few days. If untreated, congenital TB is fatal, which underscores the importance of considering congenital TB in infants who are at risk and who have unexplained illnesses. 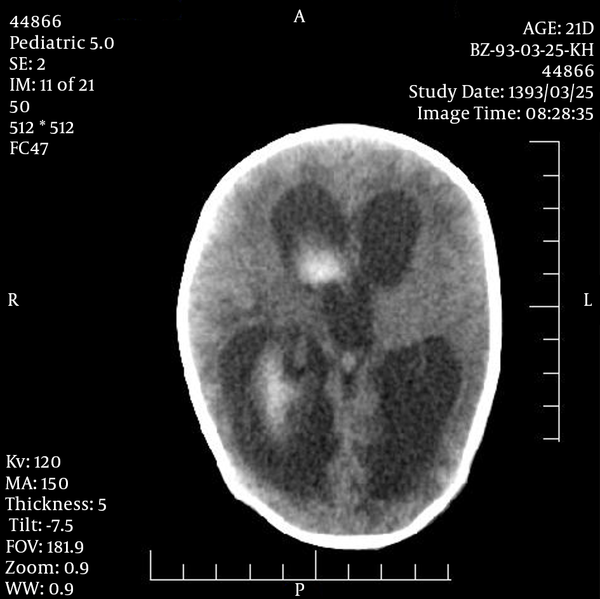 It is important to suspect TB meningitis in newborns with perinatal IVH and concomitant hydrocephalus even if the baby does not show the typical manifestations of the condition such as hepatosplenomegaly, particularly when the mother has a positive history of TB before or during pregnancy. The authors would like to thank all study participants as well as Dr. B. Bonyadi, a specialist in pediatric infectious disease, Dr. M. Memarzadeh and Dr. Soleymanzadeh, pediatricians, and also all of the nurses and staff of the neonates ward of Bentolhoda hospital in Bojnurd, Iran. We are also grateful for the help of the health center of Bojnurd, especially Mr. Sattar Saedi, and the T.B. research center, especially Mrs. Lotfi.